Street View lets you virtually behold amazing sights like Yosemite's El Capitan and The World's Largest Rocking Chair without ever leaving your computer. But if you're like me, occasionally you need to go somewhere in real life. And it's not always easy to find your way around an unfamiliar place. To help with this, we've been hard at work integrating Street View into the driving directions feature of Google Maps so that now you can preview your route before hitting the road. Reno, Nevada has been shaking things up the past few weeks with a series of frequent earthquakes. The Reno Gazette-Journal has been keeping tabs on the activity with a My Map they've put on their website. Looking at this map is pretty interesting, because the pattern of the earthquakes looks like it's following a faultline. I've also been keeping an eye on the action with the USGS real-time earthquakes Mapplet and Google Earth layer. Now let's just hope I don't see any activity in the Bay Area popping up! My Maps has proven to be a popular way for news sites to show their viewers where the news is happening as it is happening, since a map can easily be embedded in a website and edited as news develops. Recently, we heard from a producer at CBS in Chicago, who has created a My Map with information to help keep residents informed about the spate of shootings that have taken place in the city recently. Some other recent news stories with embedded maps that caught my eye include a map about the Pope's visit to New York in Newsday, locations of US food banks for a PBS story on hunger in America, and the carbon footprint of the Olympic torch for a Slate story. As you know, the Democratic primary is coming down to the wire, and American voters are following each set of state results more closely than ever before. We wondered what would make the difference in the tight Pennsylvania primary—and what those results might indicate about the rest of the primary process and the general election. So we turned to numbers-cruncher Jim Barnes from the National Journal and asked him to weigh in on different sets of demographic data. Jim helped us set up an embeddable Google Map comparing different essential factors for the Democratic primary in Pennsylvania. Age. Barack Obama has generally drawn more support from younger voters while Hillary Clinton’s base has come from older voters. With 15.2 percent of its overall population aged 65 or older, Pennsylvania has the third biggest population of seniors in the country after Florida and West Virginia. The candidate who does a better job turning out this core age group could take a big step towards winning the primary. Take a look at the percentages of registered Democrats by age bracket. Democratic primary in the 2002 gubernatorial race. In 2002, then-Pennsylvania State Auditor General Bob Casey Jr. lost the Democratic gubernatorial primary to then-Philadelphia mayor Ed Rendell, who went on to capture the statehouse. Casey carried 57 of the state’s 67 counties in that primary, but Rendell won the contest because of his strength in the southeastern part of the state, specifically the four suburban and exurban counties outside of Philadelphia—Bucks, Delaware, Chester and Montgomery—where he carried more that 80 percent of the vote. In the Democratic presidential race, Rendell has endorsed Clinton, and Casey is backing Obama. Whether Rendell can help Clinton hold down Obama’s margins in the Philadelphia area, where he is still popular, or Casey can give Obama a boost among his political base in western, central and northeastern Pennsylvania could be pivotal in this primary’s outcome. Here are county-by-county results for the 2002 Democratic primary for governor. Geography and growth. Based on the results seven weeks ago for the primary next door in Ohio, Clinton should be favored in the Keystone State, but Pennsylvania is more diverse state in terms of its patterns of growth. It has rural and metropolitan areas that are losing population, and fast-growing exurbs. For Obama to do well, he must win not only in Philadelphia and Pittsburgh, but also in some of the faster-growing parts of the state. Track the rate of population growth in Pennsylvania counties from 2000-2007. Race. Obama has had some difficulty winning a significant share of support from white voters in most of the 2008 Democratic presidential primaries, but at the same time he has dominated Clinton in regard to the African-American vote in these contests. Here is the racial breakdown of Pennsylvania's 67 counties. Religion. Obama and Clinton recently participated in a forum on issues of faith that was held at Messiah College in Pennsylvania. So far in this primary season, Sen. Obama has done well among Democratic primary voters who identify as Protestants and other denominations, but lagged among Catholics. Review the data on religious adherence by county. As technology continues to be an influential part of this race for President, we hope you can use this map to gain a better understanding about which factors are causing Pennsylvania citizens to cast their vote. Try using the data to make your own predictions for the Pennsylvania outcome, then check if you're right by following live results tonight on Google Maps. Google Transit's Earth Day Challenge: the results are in! A few months ago, we issued a challenge to public transit agencies: get your routes into Google Maps in time for Earth Day. The response has been incredible, and now that Earth Day has arrived, we've got some great news to share: we have nine new agencies across the country participating in Google Transit! ...And that's not counting the six that we added last week! Living in San Francisco, I'm especially excited about the addition of Muni to the lineup of participating Bay Area transit agencies, which also includes BART, Caltrain, and VTA. It's now easier than ever to plan trips across the region using multiple local transit agencies -- I can head from the de Young Museum in San Francisco over to the Greek Theatre in Berkeley, easily making connections across agencies. No car needed! Our goal is to be able to offer transit directions as an alternative to driving directions wherever possible. If your local transit agency isn't already participating, do your part for Earth Day by getting in touch with them and telling them you'd like to see them on Google Maps! Google is one of the sponsors for the upcoming GeoWeb Conference 2008, which takes place in Vancouver July 21-25. Just one of the exciting things happening is a student competition to create software or solutions that advance the development of the GeoWeb. The competition is open to all full time students anywhere in the world. Check it out! Now that Google Earth 4.3 has launched, we're pleased to be realizing our goal of Google Earth being a canvas upon which all sorts of interesting data can be visualized. Now we're moving more and more towards supporting data that is dynamic; if we want Google Earth to model the real Earth, we need Google Earth to be different every time you open it up. I love the combination of the new day/night effect with the Clouds layer -- has Google Earth ever looked quite so much like the real Earth? We've done several dynamic things already: traffic, weather, news courtesy of the New York Times, and YouTube. But don't wait for us to create more dynamic data - we've always believed that the greatest content is created by our users. Through the magic of Network Links in KML, any dataset can be set to auto-update at whatever interval is appropriate. The KML Gallery has several great examples, such as real-time earthquakes and current air quality. The world changes quickly. 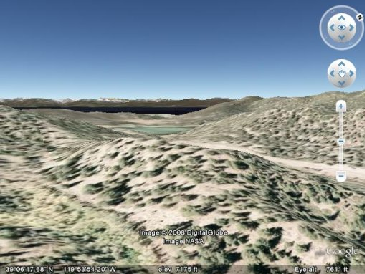 With Google Earth and KML we - and you - have the tools to model those changes. Look for more great dynamic content from us in the future... and we'll look for even greater dynamic content from you. 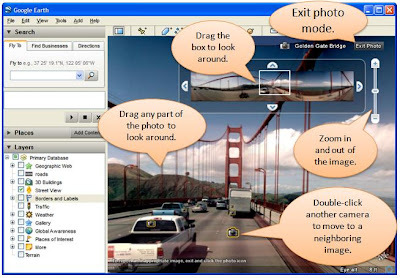 Along with many other features in Google Earth, Sky is new and improved with the release of the Google Earth 4.3 client. The first thing you'll notice is that switching from Earth to Sky is much faster in the new version, thanks to some clever re-working of the client internals. Once you're in Sky, you'll see that we've re-worked the landing zone around the Pinwheel Galaxy. We've created introductions for each folder, giving you a brief description of that folder's layers and links so you can easily start exploring. Last but not least, we've also added four exciting new layers. When we updated Sky a few months ago, one of our goals was to present views of the sky across different wavelengths and time. The imagery from Spitzer, Chandra, GALEX, WMAP and IRAS showed how different the universe looks depending on how you view it, and the historical maps by Cassini and Hevelius showed how humankind's view of the stars has changed over time. With this update, we've expanded along the audio-visual axis, with layers from Celestron, SpaceTelescope.org's Hubblecast, StarDate, and Virtual Tourism joining the podcasts from Earth & Sky to provide you with sights and sounds as you explore the universe. These audio-visual layers use Flash, which is now supported on Macs in 4.3. The Hubblecast brings you the latest science from the Hubble Space Telescope in video form, complete with animations and explanations by the astronomers doing the observations. StarDate, produced by the University of Texas' McDonald Observatory, provides daily podcasts about the latest astronomy news and what's up in the sky for stargazers. The Celestron layer uses the audio from its SkyScout to give users a guided tour of over 200 objects around the sky, from constellations to the brightest stars and deep sky objects that can be seen with the naked eye. 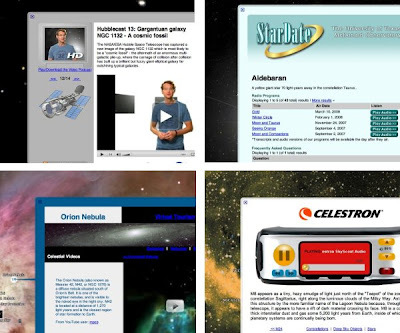 Keir Clarke of Virtual Tourism put together an excellent collection of astronomy videos from around the web, all registered to the proper location on the sky.Keir's efforts follow in the footsteps of Stephanie Lange, who assembled the Hevelius Constellations layer. They are examples of Sky users who created something so cool that we had to share it with the widest possible audience. Keep those layers coming and happy exploring! You will then see a time slider that can control the simulated the time for the sun. Move the scroll button to change the current time, and press the play button on the right to see it animated. To change other options, such as the animation speed and the time zone, click on the clock icon to the left. During the last several months a team of Googlers has been charged with bringing you the latest and greatest in traffic congestion information. We were improving the infrastructure, refactoring the code, solving pesky quality issues, and setting up the new data pipelines. Once we deployed our new traffic code base, we wanted to use the new flexible architecture to deliver cool, useful features. Today, we're very excited to launch two great new features. Now you can see what the traffic is typically like at any given day and time, making planning a drive easier than ever by helping you avoid likely congestion. Heading to the airport on Friday? Want to know what the traffic congestion is likely to be when you travel? Click the "Traffic" button in the corner of the map (it will only appear when we have traffic coverage for your area), and our new traffic control will come up. 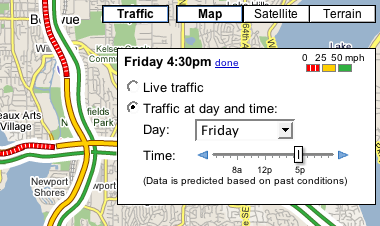 You can view the live conditions, or click "change" and it will let you see average traffic patterns in the area at any hour on any day of the week. The predicted traffic is based on past conditions -- as your stock broker would say, past performance is no guarantee of future results! 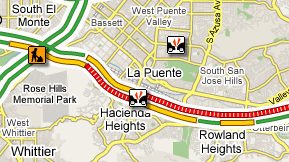 We also now display accidents, construction, and road closures in most areas where we have traffic coverage. If the traffic looks sluggish, you can find out why. Now we're not just showing the congestion, but also what causes it - accidents, blockages, scheduled construction, and other pesky impediments to the progress of human civilization. Clicking on the icon gives you details, including an estimate of when the problem is going to go away. By the way, if you think that traffic is bad where you live, take a look at Los Angeles. If you do live in Los Angeles - our hats are off to you (and thank you for providing such a rich data set for debugging!). For all the Googlenauts flying high above Google Earth, we have some good news: you can finally land on the surface of our planet. After a long wait, Street View has arrived in Google Earth, thanks to the new PhotoOverlay feature of KML. 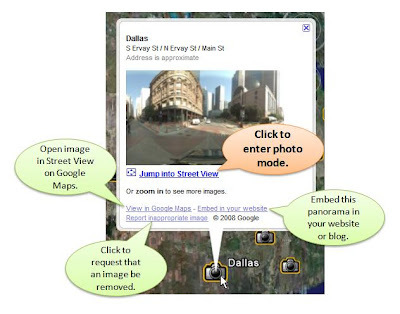 Clicking on any of the camera icons brings up an information balloon, containing information such as the approximate street address where that image was taken, a thumbnail image, and several links, such as options for viewing the image in Google Maps, embedding it in your website or blog, or requesting removal of an image. When you find an interesting image you want to bookmark, you can right-click on the camera icon and save it to My Places. Have fun exploring! 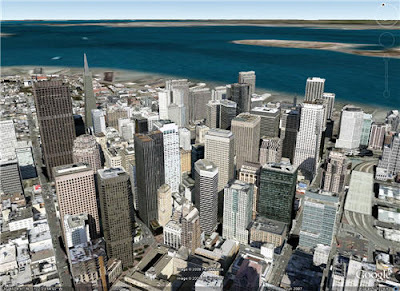 Google Earth's "3D buildings" layer is now bigger and loads faster, making it better than ever! 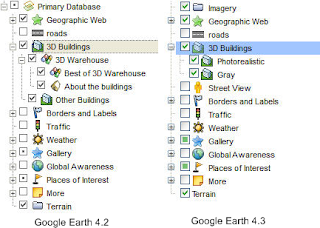 In Google Earth 4.3 you'll notice that we modified the sub-folder names in the "3D Buildings" layer to more accurately reflect the multiple sources of 3D data. "3D Warehouse" and "Other Buildings" have been replaced by "Photorealistic" and "Gray". As the names imply, the "Photorealistic" folder consists of photo-textured 3D buildings, while the "Gray" folder contains untextured buildings, largely extruded building footprints. 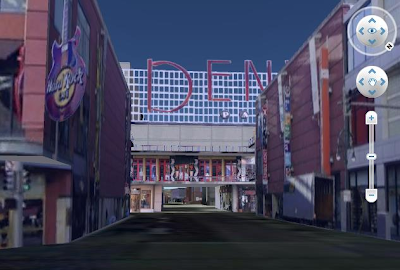 The "Photorealistic" folder contains buildings published to the 3D Warehouse, cities and towns of all sizes via the Cities in 3D program, as well as signature buildings and and auto-textured city models generated by Google. We're introducing tens of thousands of 3D buildings around the world for Google Earth users to explore. Included in the mix are dozens of urban centers including Oakland, San Francisco, Baltimore, Phoenix, Austin, Tampa, Orlando, Raleigh, Boston, Charlotte and Atlanta. 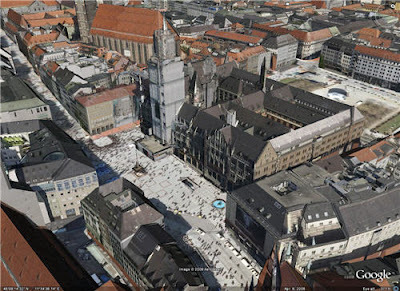 In Europe, city models for Munich and Zurich now join Hamburg, which prior to today was one of the few complete cities models in Google Earth. In Asia, there are thousands of new buildings in dozens of Japanese cites, including Tokyo and Hiroshima. We've been focusing our efforts on developing the larger cities around the world, but this shouldn't prevent smaller cities and towns who are eager to get on the map from participating as well. The Cities in 3D program provides an easy path for cities or local governments to efficiently contribute their data to Google. Some of my small town favorites are Boise Idaho, Amherst Massachusetts, and even the little hamlet of McMinnville, Tennessee. 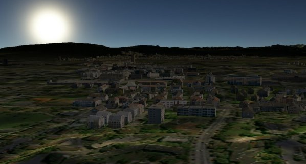 Models from 3D building enthusiasts account for a significant portion of the buildings in Google Earth. In fact, user-contributed models that meet our acceptance criteria are incorporated into the auto-generated cities. Better yet, data provided by users contains meta-data (such as an address, description, links, etc.) for the building. Please keep the those 3D buildings coming! The virtual 3D mapping of the world is really beginning to take shape and we'll need the continued support of the community to make this possible. 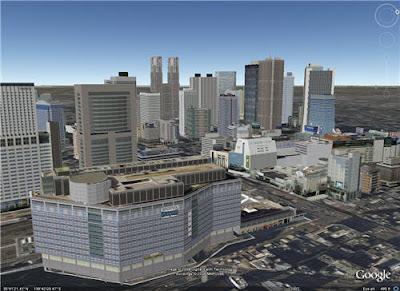 If you'd like to take a crack at modeling a building for Google Earth, the tools are free and everything you need to get started can be found here. 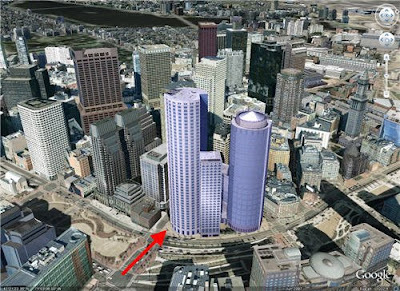 This leads me to another new feature in Google Earth 4.3: we've made it easier to view a building's details. If you hover your mouse over a building that contains meta-data, the building will appear highlighted in blue just like a link on a webpage. 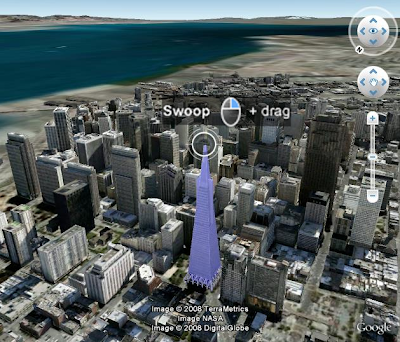 When you click on the building, a Google Earth bubble appears displaying more information about the model. No longer do you have to sort through the yellow house placemarks! I mentioned that it was faster, right? What I meant to say was *screaming* fast. 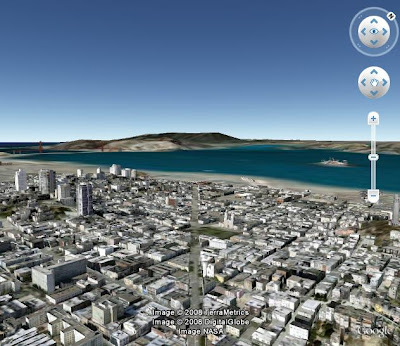 Google Earth 4.3 loads an entire 3D city in seconds -- it's amazing to watch. 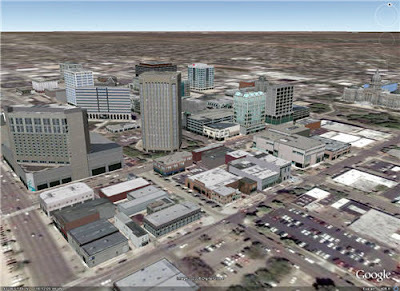 Fly to any of the cities I mentioned, turn the "3D Buildings" layer on and see for yourself. To achieve our vision of creating a mirror-image of the earth we need deliver massive amounts of data to your desktop. To solve this challenging technical problem our engineering team developed an entirely new technology to more efficiently stream the massive volumes of 3D data available we'll continue to add to Google Earth. I could go on forever, but I want to get back to exploring my new 3D world, and I'll leave you to start exploring for yourself! 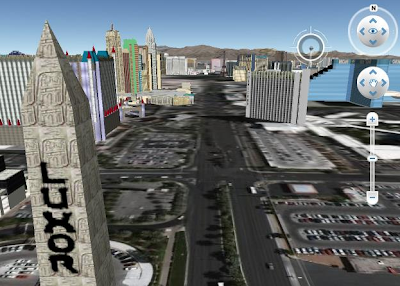 With Google Earth 4.3, we're bringing to you cities filled with 3D models. However, what makes this data impressive is having the right point of view. An aerial perspective works well for viewing satellite imagery, but it's not the best for getting the full experience of 3D buildings and terrain -- these views are better from the perspective of a person standing at ground level. That brings up the question: how do you seamlessly transition from an aerial to a ground level view? 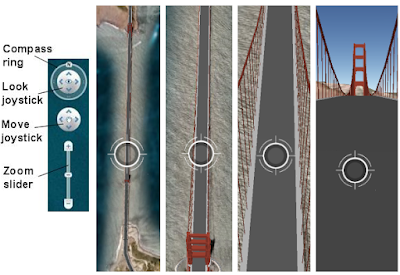 Our latest version of Google Earth is the answer: it enables you to view and interact with 3D content in unique ways. You also have the ability to interact with 3D buildings. By clicking-and-dragging the right mouse button, you can select a target point and swoop to the top of the Transamerica Pyramid in San Francisco. Happy cruising - and enjoy the views! 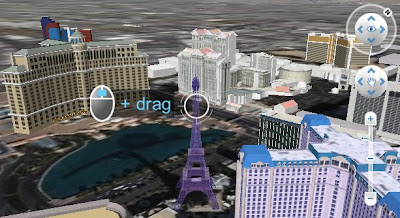 New navigation - Google Earth is a 3D application, but we realized that a lot of our users never quite got the hang of using the tilt feature to navigate around 3D features like mountains and buildings. Not only that, but even for expert users, if you tried to get down to the ground and navigate at street-level, navigation was cumbersome and confusing. Well, no more. We spent a lot of time rethinking how users interact with 3D data. We realized that when in outer space and far above the ground, you really want standard map-like controls that allow you to pan and zoom smoothly. However, if you want to get down to the ground and check out a city street, you really want a street-level navigation mode like you'd typically find in a video game. Finally, you want to be able to seamlessly transition between these modes as you fly down to visit a city and fly back out to space. So we modified the zoom control. As you get closer to the ground, your view slowly tilts, almost as if you are parachuting onto the ground. We also added a new control, the "look" joystick, which allows you to look around. If you are on the ground, you can change your viewpoint and look up at buildings, down canyons, or over at the rising sun. If you use the "pan" joystick when on the ground, you will follow the ground as if you were walking on it. More, faster 3D buildings - What good would fancy new navigation controls be if there wasn't something new to look at? While we're regularly adding new user-created SketchUp buildings submitted through 3D Warehouse, we decided to take things up a notch for this release by including photo-realistic models for dozens of new cities. Take a spin around Tokyo, Munich, or Boston to get a taste. We've also significantly enhanced our approach to rendering 3D data to greatly improve performance and realism. 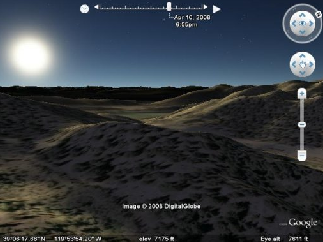 Here comes the sun - The world may not be flat, but something about the lighting in the old Google Earth sure was. If you've gotten tired of seeing everything lit with the mid-day sun, then we have just the trick for you. 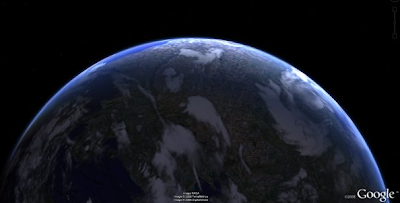 Click on the new sunlight button on the toolbar in Google Earth, click the play button on the time slider, and watch the sun as it circles around the globe. Try getting close to the ground and look up at the eastern sky, and see the sun rise. I'm more of a sunset kind of person, but you can just look to the west and watch the sun disappear behind the hills too. While it's no substitute for the real thing, it is great fun to play around with. Street View - Ever since we introduced Street View in Google Maps back in May 2007, people have been asking us when the same data would be available in Google Earth. 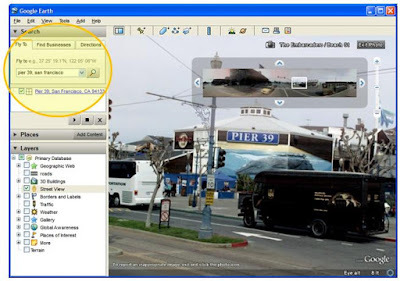 Well, that day is today; using the PhotoOverlay feature available in KML 2.2 (or should I say the OGC standard KML 2.2,) we have made all of the Street View panorama photos available as a layer in Google Earth. 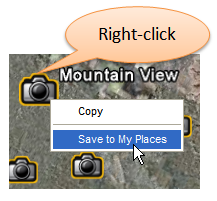 Double-click on an icon to fly into a photo, and navigate from photo to photo. Imagery acquisition date - As Product Manager for Google Earth, I'm fortunate enough to get to talk to a lot of our users, and usually the first question I get asked is, "When was the imagery taken?" With the new imagery acquisition date feature, I no longer have to answer. Now you can just move your mouse cursor over an area you're interested in and see when the image was taken right in the status bar in Google Earth. We don't have dates for everywhere, but we have great coverage, so have fun exploring. 12 new languages - When Google Earth first launched in 2005, it came in any language you wanted, as long as it was English. 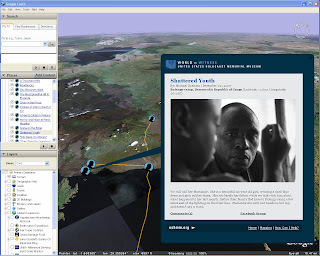 We've come a long way since then, with support for 26 languages in Google Earth 4.3. New additions include: Danish, English (UK), Spanish (Latin American), Finnish, Hebrew, Indonesian, Norwegian, Portuguese (PT), Romanian, Swedish, Thai, and Turkish. I've recruited some of the experts on the team to give a deeper dive into all these great new features, so be sure to check back over the next few days to read all about them. When we started Google Earth Outreach as a 20% project over 2 years ago, we envisioned supporting public benefit uses of Google Earth. The official launch of the Google Earth Outreach program last June created a place where non-profit organizations could go and learn how to use tools to help illustrate their powerful work in a geospatial context. We opened up our Outreach Showcase Gallery to feature great examples of those using Google Earth for good, whether they be non-profit, for profit, governmental or otherwise. One of our earliest contributors to the Gallery was a company called Terradex. We're pleased to see they received the United States Environmental Protection Agency 2008 Environmental Achievement Award yesterday for their innovative use of Google Earth to educate the public about the environment. Terradex has created a Google Earth layer called AirWatch that provides real-time air quality information over geographic regions in the United States. Terradex has since extended the AirWatch layer to cover China, Mexico and the United Kingdom. This work inspired the EPA's recent launch of the AirNOW program. Terradex also created Climate Watch to enable users to view their city's greenhouse gas emissions in comparison to neighboring communities using Google Earth or Google Maps. It just goes to show that the sky's the limit on using new tools to empower the public with information in a geographic context. While I love watching videos on YouTube, the experience is even better for me when I can view their geographic context. In addition to using Google Maps to get local business details, read reviews, and check out photos, I can now also get a sneak peek with embedded videos. Local business owners can easily add YouTube videos along with other content such as business details, photos, and descriptions to their listings. To do so, simply upload your videos to YouTube and ensure that the 'embed' option is turned on. Then, associate your video to your business listing through the Local Business Center. Whether you own a bakery, bed-and-breakfast, or accounting service, enhancing your listing on Google Maps with descriptions, photos - and now videos - is a piece of cake. However, the internet is about much more than just searching and viewing information. It's also about publishing. It wouldn't be what it is today without blogs, wikis, social networking sites, and other forms of user-generated content. The web is what makes all of this possible, and HTML is what makes the web possible -- a standard format that enables any web browser to view any web page. HTML's standardization was a very powerful thing. Rather than being locked up in a proprietary format, or only viewable using one specific vendor's product, web pages can be viewed and shared without encumbrance, for free. This brings me to today's wonderful news: KML is now an international standard! KML was originally created as a file format for Google Earth, allowing users to overlay their own content on top of our base maps and imagery. It's since become something much larger -- KML has become the HTML of geographic content, the dominant way to share user-created maps online. There are now tens of millions of KML files available online, hosted on more than 100,000 unique domain names. KML is supported by a large and growing number of vendors and products, and can no longer simply be described as Google Earth's file format. Because it has transcended Google Earth in scope, and even outgrown Google itself, we have decided to give it away. Starting today, Google no longer controls KML. The Open Geospatial Consortium (OGC), an international standards body, has announced the completion of KML's standardization process. KML has become an OGC Standard, and the OGC will take responsibility for maintaining and extending it. This transfer of ownership is a strong reflection of Google's commitment to open standards. Fundamentally, our interest is not to control information, but rather to encourage its spread. When geographic content is easy to put online, everybody benefits. Just as HTML has benefited the world by enabling new forms of information sharing, we hope that KML will do the same for mapping. The Sydney Opera House may be one of Australia's best known architectural landmarks, but there are many more incredible designs throughout the country. And now you don't even have to travel Down Under to experience them all - the Royal Australia Institute of Architects has developed a layer for Google Earth which contains photos and details about nearly 600 State and National award winning design projects in and around Australia, along with 60 incredible 3D models of the National award winners from the last five years. Read more about it on the Google Australia Blog. We're pleased to announce today that home buyers, owners, and real estate junkies can now find Street View integrated with the real estate listings, recently sold homes, and property records on Trulia. We're excited to use the new Street View API to add efficiency to the real estate search experience and help home buyers discover more information about particular neighborhoods. Home buyers have limited windows of opportunity to visit open houses. 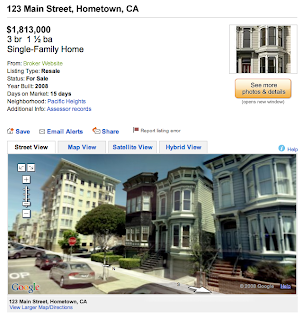 With Street View, buyers on Trulia can preview homes and surrounding areas to find the right ones to visit. 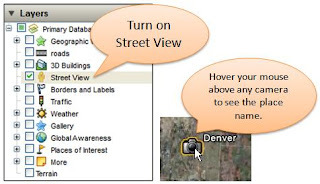 For example, people can uncover information about an area that might not be readily available or visible in property descriptions and still photos (railroad tracks across the street, obstructions of a view, or heavy traffic at nearby intersections). This is another unbiased tool on Trulia – along with comparables, real estate market stats and trends, and the Trulia Voices community – that adds transparency to the real estate search process. Now you can discover new information about streets and neighborhoods through the maps on our site -- before venturing out to an open house. For example, if you're wondering if a particular area is family friendly or not, you can use Street View to look for nearby bus stops, low speed limits, cautionary signs and local schools. And you can even use it to spot certain amenities such as cafes, parks, shops, laundromats, and grocery stores. Best of luck in your real estate search! Today, I had the pleasure of announcing that the Chicago Transit Authority (CTA) is partnering with Google to bring schedule and station data for our 8 rail lines and 154 bus routes to Google Maps. 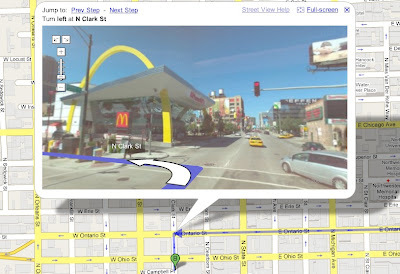 Having CTA's information available on Google Maps allows us to reach a broader audience; by including our station/stop icons in maps, we can seamlessly introduce people to public transportation options as they look up locations or search for directions, and encourage alternatives to driving. As the second-largest transit agency in the United States, the CTA serves an average of 1.6 million riders per weekday and nearly 500 million rides a year, so being able to provide this new service to our vast ridership and all of the 45 million tourists who visit this great city every year is a great stride in promoting the use and convenience of public transportation. With this information now at your fingertips, I hope to see you on the L soon! Today, the U.S. Holocaust Memorial Museum is asking you to take a moment to open Google Earth and zoom down into the broken heart of central Africa, where 500,000 to 1 million people were killed in the Rwandan genocide of 1994. The aftermath of the genocide sparked a war in neighboring Democratic Republic of the Congo in 1996 and a second in 1998, which, according to a new study, has claimed the lives of more than 5.4 million people. It’s a number equal to the combined populations of Los Angeles and Philadelphia and greater than any conflict since World War II. Join us as we travel to Rwanda and Eastern Congo. Meet Rwandan genocide survivors and heroic Congolese struggling against a daily onslaught of violence. Lucienne, a 24 year old woman, was enslaved for months as the ‘wife’ of a group of rebels. Dr. Denis Mukwege, a heroic surgeon at Panzi Hospital in Bukavu, is trying to fight the unprecedented violence against women in Congo. 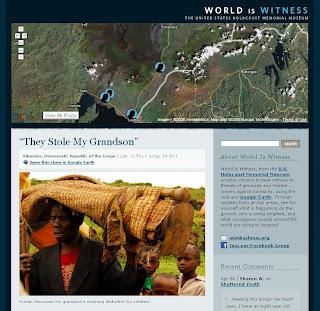 This journey to central Africa is documented in the museum’s initiative, World is Witness, a new layer in the Global Awareness folder in Google Earth that will be updated with posts from around the world. This ‘geoblog,’ a follow-up to Crisis in Darfur, opens a window into the lives of people at risk or affected by genocide and related crimes against humanity. Explore the layer to learn more. Share your thoughts and comments on our geoblog, learn more about the Museum’s genocide prevention efforts, join our Facebook group, and find out how to help. 1) The fans of 'Sweet Lou' get to see his three cities updated. 3) In 1860, Sir Rutherford Alcock was the first foreigner to climb this mountain. 4) This major U.S. city was granted "town" status on February 2, 1856.
of the richest silver mines in the world. Cordova (1517) and Cortez (1518) expeditions. 7) With over 100 buildings, including a bowling alley, this site is home to the largest community on its continent. 9) On the verge of being devoured by the Sahara, this town, which was once a center of learning, is a Moorish architectural jewel. 10) Now visible in Google Earth, this enormous dam will not be fully functional until 2011.